Microsoft Office Outlook is a mature mailing application used very common among Windows users. 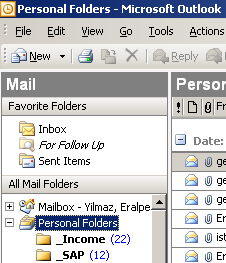 Many Outlook users create at least one Outlook personal folder to store their mail data in Outlook .pst data files in different folders. Since I frequently import outlook data file contents by adding the Outlook pst file, I'd like to share how you can open .pst files and add as an Outlook personal folder. Open Microsoft Office Outlook, then using the main Outlook menu select "File > Open > Outlook Data File..." in order to select the above Outlook .pst file as the target Outlook data file for openning and adding. When the Open Outlook File Dialog box is displayed, point to the Windows folder where the outlook data file (Outlook .pst file) resides. Then click Open button. While adding .pst file as an Outlook personal folder, you might get the following warning message. Continue to add the data file as personal folder in your mailing application MS Outlook. 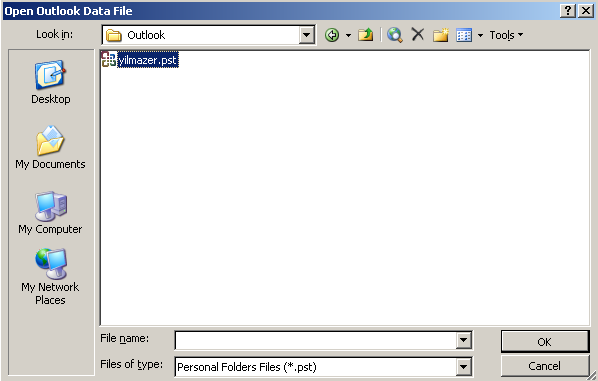 Here how your .pst Outlook data file is displayed as personal folder in Microsoft Office Outlook email client.